This Maytag French door refrigerator is made with heavy-duty components and features that deliver the right kind of cold exactly where it's needed. 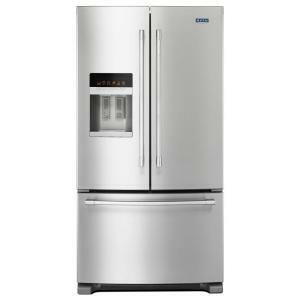 Fingerprint resistant stainless steel keeps this fridge looking as good on the outside as it works on the inside. With the touch of a button, the PowerCold feature quickly chills down the refrigerator. The temperature-controlled Wide-N-Fresh deli drawer provides the perfect place to keep deli items so they stay fresh longer. And when it comes to durability, this French door refrigerator has stainless steel handles to give you something hardy to grab on to, while the 10-years limited parts warranty on the compressor means you can count on it hold the cold for years. Kitchen Goods, a unit of Dominant Systems Corporation, uses sophisticated crawler software to search the web looking for great product deals online. For this page, related items include products we find that match the following keywords: "Refrigerator" at our vendor partner Home Depot. Maytag 36 inch W 24.7 cu. ft. French Door Refrigerator in Fingerprint Resistant Stainless Steel is one of 272 Refrigerators and related products available for sale through Kitchengoods.com, If you have any questions on this product, please give us a call at 734-971-1210 during the hours of 9am - 5pm EST for assistance. Thank you for shopping at Kitchen Goods, your place for kitchen gadgets, and more!